LifeTein: antibody services for cell & protein research! LifeTein provides a complete portfolio of antibody services including free peptide antigen design, peptide synthesis, and polyclonal and monoclonal antibody production, development, and purification services. As a leading provider of superior custom antibody development services, LifeTein promotes the understanding of life one protein at a time and offers a wide range of industry-leading platforms and services. LifeTein can customize a discovery and development path to fit your exact needs. LifeTein's AdjuBoosterTM adjuvant was developed at our antibody campus core facility. It was proven to increase the immune response in a shorter time than competing products. Our facility uses this innovative new system to generate high-affinity custom antibodies. LifeTein scientists will work with you to generate custom antibodies for your research and development programs. 1. Free Peptide Antigen Design: Stronger antigenicity for the chosen domain. 2. Custom Polyclonal Antibody Services (  or ): Peptide affinity column purified antibodies for less background. 3. Custom Mice Monoclonal Antibody Services (Mice ): Guaranteed two positive clones. 4. Custom Rabbit Monoclonal Antibody Services (Rabbits ): Higher specificity and stronger affinity. 5. Custom Sandwich ELISA Antibody Pairs Services: Higher sensitivity. Get a quote or order now. We will process your order immediately. Please CLICK HERE for the quotation form. Antibodies are peptide affinity column purified for the higher concentration and the better specificity. No cross-reactivity for phosphopeptide-specific polyclonal projects, and a guaranteed 1:32,000 ELISA titer. Double peptide affinity column purification are used to remove all possible unrelated IgGs. 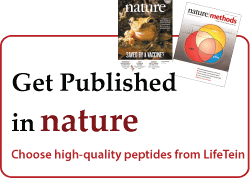 LifeTein helped designed and synthesized a series of phosphorylated peptides. 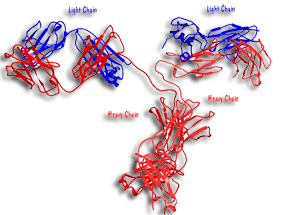 Then the peptides were used for phospho-specific antibody productions. The phospo-specific antibodies by LifeTein were confirmed to react with the epidermal growth factor receptor (EGFR). The Hung's lab showed that AGO2-Y393 phosphorylation mediates EGFR-enhanced cell survival and invasiveness under hypoxia. These findings suggest that modulation of miRNA biogenesis is important for stress response in tumour cells. Custom peptide antibodies were provided by LifeTein to study SKPO-1. The SKPO-1 peroxidase domain peptide was synthesized by LifeTein. The polyclonal antibodies were raised in rabbits and then affinity purified to accomplish high specifications and concentrations. The antibodies were successfully used to localize the SKPO-1 protein in hypodermis. It was found that the peroxidase SKPO-1 contributes to the host immune response during infection.